I have Figmas and Nendos that I want to trade rather than sell. They have all been opened and displayed but rarely handled. I am open to ANY and ALL trades. 1. Araragi: Good condition, has all pieces, displayed only. 2. Touma : Good condition, has all pieces, displayed only. 3. Kiritsugu: Good condition, has all pieces, displayed only. 4. Miku Append : Good condition, has all pieces, displayed only, base still lights up. 5. Erio : Good condition, has all pieces, displayed only. 6. Kuroneko : Good condition, missing dvd and one flat hand, does contain stickers for dvd, displayed only. 7. Tooko: Poor condition, broken neck peg stuck in body, slightly scuffed, missing open book and chair clip. Would be good for parts such as the face, hands, and can. 9. Fraulein Movie Yoko : Good condition, missing one small gun, displayed only. I also have the original BRS and BGS Figmas, which I would be willing to part with. As well as the BGS Nendoroid. 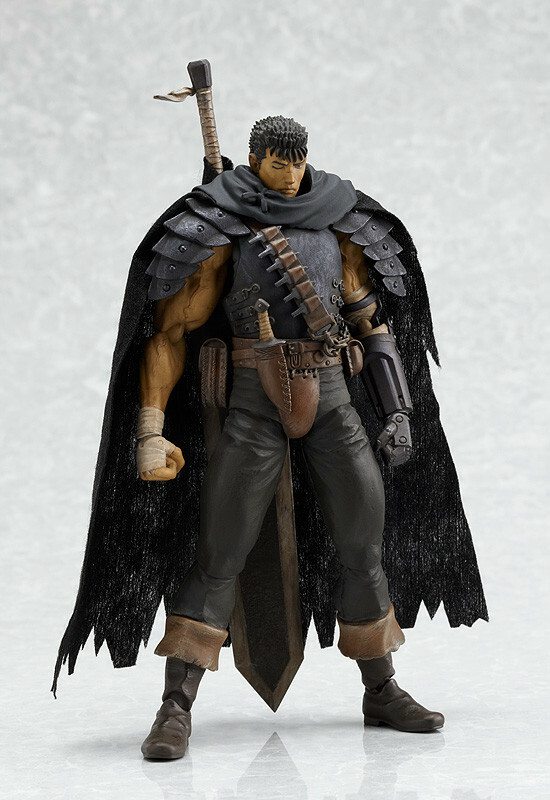 A long shot I know (considering how awesome the figure is) but does any one have a spare default face and hair piece for the Guts Black Swordsman figma? I really want to make a simple custom of the Berserk armor figma with a helmetless Guts with the white highlight in his hair but I don't want to have to dish out a crap ton of money for a new figure! P.s. if anyone has the arms from this figma also let me know! ThunderRhapsody (Il y a 5 ans) #2008806it was on ebay and someone else bought it. I've just had a look at the ads section and the cheapest I could find is from US and i'm a little wary over custom charges. found this on amazon, is it a good price? enikelz (Il y a 5 ans) #2007028do you have a photo? or link to it? At £35 you could get it from sellers from this site perhaps with a good condition box and mint figure? it was on ebay and someone else bought it. I've just had a look at the ads section and the cheapest I could find is from US and i'm a little wary over custom charges. ThunderRhapsody (Il y a 5 ans) #1993430Hi, I'm quite interested in the figma Link figure and I have found one for £35 pre-owned. Is this a good price? the seller says that the figure is mint but the box is damaged a little. however saying that, the picture shown has Link completely different to how he appears in the box; Accessories in hands, different face. I hope this is the right place to post this, I've just noticed the "For Enthusiastic Figma Collectors Only!" and I don't even own one yet. do you have a photo? or link to it? At £35 you could get it from sellers from this site perhaps with a good condition box and mint figure? Hi, I'm quite interested in the figma Link figure and I have found one for £35 pre-owned. Is this a good price? the seller says that the figure is mint but the box is damaged a little. however saying that, the picture shown has Link completely different to how he appears in the box; Accessories in hands, different face. I hope this is the right place to post this, I've just noticed the "For Enthusiastic Figma Collectors Only!" and I don't even own one yet. This item is indeed quite rare. It comes with the purchase of Figma #001 however even if u manage to get this figma now, u might still not be able to obtain this scarf. I've seen similar accessories like this item on ebay (e.g. christmas accessories, miku's head phones) their price varies from USD$10-20 excluding shipping cost. Given the high price for a small rare accessory, many might just pass on and live without it. Hope my advise would give u a suitable price range if you intent to sell this accessory. I was very lucky myself with this item, since I got two of them as a bonus from a seller when I bought some figma's 4-5 years ago! I only recently realised I actually have never used them and they seem to be quite wanted/rare.